Chemokines and chemokine receptors are implicated in regulatory T cell (Treg) trafficking to sites of inflammation and suppression of excessive immune responses in inflammatory and autoimmune diseases; however, the specific requirements for Treg migration into the inflamed organs and the positioning of these cells within the tissue are incompletely understood. Here, we report that Tregs expressing the TH1–associated chemokine receptor CXCR3 are enriched in the kidneys of patients with ANCA–associated crescentic GN and colocalize with CXCR3+ effector T cells. To investigate the functional role of CXCR3+ Tregs, we generated mice that lack CXCR3 in Tregs specifically (Foxp3eGFP-Cre × Cxcr3fl/fl) and induced experimental crescentic GN. 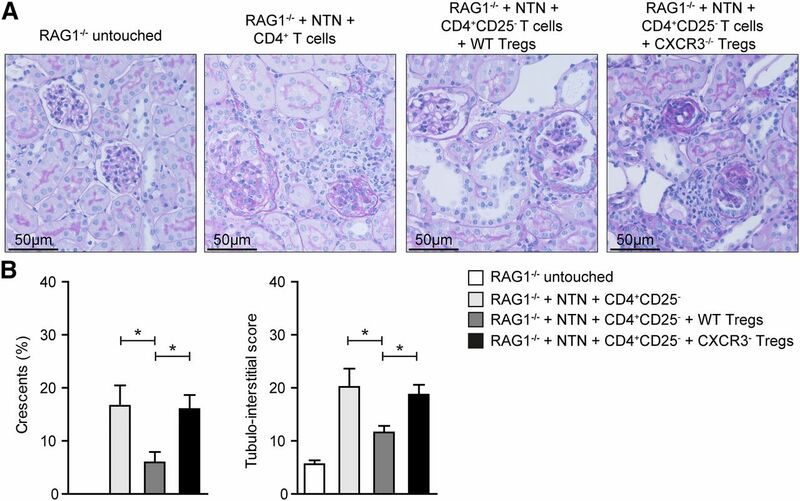 Treg-specific deletion of CXCR3 resulted in reduced Treg recruitment to the kidney and an overwhelming TH1 immune response, with an aggravated course of the nephritis that was reversible on anti-IFNγ treatment. Together, these findings show that a subset of Tregs expresses CXCR3 and thereby, acquires trafficking properties of pathogenic CXCR3+ TH1 cells, allowing Treg localization and control of excessive TH1 responses at sites of inflammation. In this study, we investigated the functional role of chemokine receptors expressed on Tregs in crescentic GN. We analyzed the chemokine receptor expression profile on renal Tregs in patients with ANCA-associated GN, the most common form of crescentic GN, and a murine model of GN. We show that the TH1–associated chemokine receptor CXCR3 is highly expressed on renal Tregs in human and mice. Moreover, we show that CXCR3+ Tregs are enriched in the inflamed kidney compared with those present in peripheral blood. On the basis of these results, we generated mice that were specifically deficient in CXCR3 in Tregs and provide evidence for an important functional role of CXCR3 on Tregs for the control of TH1 inflammation in a mouse model of GN. First, we established a flow cytometry–based technique to assess the chemokine receptor expression profile of Tregs in renal biopsies from patients with ANCA-associated GN (Supplemental Figure 1). We focused on CCR4, CCR6, and CXCR3, because the expression of these receptors was previously linked to Treg function. Renal Tregs were defined as CD4+CD25highCD127low/− FoxP3+ cells.19 In our experiments, we detected substantial expression of CCR4, CCR6, and CXCR3 on Tregs isolated from the kidney (Figure 1, A and B). The frequency of CXCR3+ cells was markedly increased in Tregs isolated from renal tissue compared with Tregs from peripheral blood (kidney: 56.8±3.4% versus blood: 35.0±3.7%; P<0.01) (Figure 1, A and B). There were no differences in the frequencies of CCR4+ and CCR6+ Tregs between kidney and peripheral blood, suggesting a specific recruitment of CXCR3+ Tregs to the kidney in ANCA GN. Chemokine receptor expression on renal Tregs in patients with ANCA-associated GN. (A) Representative FACS plots and (B) quantification of chemokine receptor expression of CD4+ FoxP3+ Tregs from renal biopsies (n=6) and blood (n=11) from patients with ANCA-associated GN. (C) Immunohistochemical staining of serial sections for FoxP3 (brown) and CXCR3 (red) in human renal biopsies revealed the presence of CXCR3+ Tregs (arrow), CXCR3− Tregs (double arrow), and CXCR3+ effector cells (arrowhead). (D) Section of human tonsil stained for FoxP3 and CXCR3. (E) Relative quantification of CXCR3 expression on Tregs in tonsillar specimens (n=3) and renal biopsies (n=18). (F) Quantification and (G) representative immunohistochemical staining of FoxP3+ CXCR3+ and FoxP3+ CXCR3− Tregs with direct cell-cell contact to FoxP3−CXCR3+ T cells. (H) RT-PCR analyses of renal biopsies from patients with ANCA GN (n=11–12) and controls (n=11–13) normalized to 18S RNA. mRNA levels are expressed as x-fold of controls. Symbols represent individual data points, and lines and bars represent means±SEMs. Original magnification, ×200 in C, left panel and D; ×400 in C, right panel and G. *P<0.05; **P<0.01; ***P<0.001. In line with this finding, immunohistochemical staining of CXCR3 and FoxP3 in human kidney biopsies of patients with ANCA GN revealed that about 60% of renal Tregs expressed CXCR3. Tregs were predominantly localized to the tubulointerstitial compartment (Figure 1C). The frequency of CXCR3+ Tregs in human tonsil sections, assessed by immunohistochemistry, was about 20%, which was in the range of peripheral blood Tregs (Figure 1, D and E). Of note, significantly more renal FoxP3+ CXCR3+ Tregs (>95%) had direct cell-cell contact with FoxP3− CXCR3+ cells, most likely TH1 cells, than FoxP3+ CXCR3− Tregs (57%) (Figure 1, F and G), suggesting that the CXCR3/CXCL9–CXCL10 axis orchestrates the colocalization of CXCR3+ Tregs and CXCR3+ TH1 cells within the inflamed kidney. Renal mRNA expression of TH1–associated transcripts CXCL9, CXCL10, CXCR3, IFNγ, and FoxP3 was, together with the expression of TH17–associated transcripts CXCL5, CCL20, and CCR6, markedly increased in biopsies of patients with ANCA GN compared with control biopsies (Figure 1H). The clinical characteristics of the included 28 patients with ANCA GN are summarized in Supplemental Figure 2. Chemokine receptor expression profile of Tregs in experimental crescentic GN. (A) At different time points after induction of nephritis, kidney sections were stained for the Treg–specific transcription factor FoxP3, and (B) the numbers of tubulointerstitial FoxP3+ cells per low-power field (lpf) were determined. Original magnification, ×400 in A; ×200 in B. (C) Renal Tregs (measured as FoxP3+ cells of all CD4+ cells) were quantified by FACS analysis, and (D) renal FoxP3 mRNA expression was determined by RT-PCR analysis. (E) The chemokine receptor profile was determined by FACS analysis from nephritic wild–type mice at day 30 and controls (day 0). Quantification of (F) CD4+ FoxP3+ and (G) CD4+ FoxP3− chemokine receptor–positive absolute cell numbers per kidney (n=3–11 per group). (H) Quantification of chemokine receptor expression of CD4+ FoxP3+ Tregs from the kidney and blood from nephritic mice (day 30). Symbols represent individual data points, and lines represent means±SEMs. **P<0.01. On the basis of our human and experimental GN data, we sought to investigate the functional role of CXCR3 in Tregs. To that end, we generated Treg–specific CXCR3–deficient mice (Supplemental Figure 3). Foxp3eGFP-Cre × Cxcr3fl/fl mice were viable, were fertile, and showed no obvious developmental abnormalities compared with Foxp3eGFP-Cre × Cxcr3wt/wt mice. Flow cytometric analysis of peripheral blood, spleen, and renal lymph nodes for lymphocyte subsets (including Tregs) revealed no differences between Foxp3eGFP-Cre × Cxcr3wt/wt and Foxp3eGFP-Cre × Cxcr3fl/fl mice under homeostatic conditions (Supplemental Figure 4). Immunohistochemical FoxP3 staining (Figure 3, A and B) and flow cytometric analysis (Figure 3, C–E) revealed a significant reduction in frequency and absolute numbers of Tregs in the kidneys in nephritic Foxp3eGFP-Cre × Cxcr3fl/fl mice compared with nephritic Foxp3eGFP-Cre × Cxcr3wt/wt mice. In contrast, the number and frequency of renal Tregs between wild–type and Treg–specific CXCR3 knockout mice were unchanged under homeostatic conditions. In addition, no changes in the frequencies of CCR4+ and CCR6+ Tregs were observed under naïve and nephritic conditions in blood and kidney for both wild-type and knockout animals (Supplemental Figure 5). Of note, CXCR3 deficiency in Tregs did not affect the frequency, absolute number, or phenotype of Tregs in the spleens of nephritic mice (Figure 3, F–H, Supplemental Figure 6, A and B). Because of the lack of reliable anti–mouse CXCR3 antibodies for immunohistochemical staining, we were unable to localize CXCR3+ Tregs or CXCR3+ TH1 cells in the inflamed kidney. CXCR3 drives renal Treg infiltration in crescentic GN. (A) FoxP3 immunohistochemistry of kidney cross-sections from control (n=6), nephritic Foxp3eGFP-Cre × Cxcr3wt/wt (n=12), and nephritic Foxp3eGFP-Cre × Cxcr3fl/fl mice (n=13) at day 30. Original magnification, ×400. (B) Quantification of tubulointerstitial FoxP3+ cells. (C) Representative FACS analysis and quantification of the (D) frequency and (E) absolute numbers of renal Tregs from control (n=4), nephritic Foxp3eGFP-Cre × Cxcr3wt/wt (n=4–11), and Foxp3eGFP-Cre × Cxcr3fl/fl (n=4–10) mice at day 30. (F) Representative FACS analysis and quantification of the (G) frequency and (H) absolute number of Tregs in the spleen from nephritic Foxp3eGFP-Cre × Cxcr3wt/wt (n=4) and Foxp3eGFP-Cre × Cxcr3fl/fl (n=4) mice at day 30. (I) Cytometric bead assay of supernatants from coculture of wild–type splenic CD4+CD25− responder T cells and splenic CD4+CD25+ Tregs from wild-type and CXCR3-deficient mice (n=5 per group). (J) IL-10 production by renal CXCR3+ and CXCR3− Tregs using IL-10 reporter mice exemplified by FACS plots and quantification. Symbols represent individual data points, and lines and bars represent means±SEMs. Con, control. *P<0.05; ***P<0.001. To investigate whether CXCR3-deficient Tregs were functionally different from wild-type Tregs (beyond their impaired trafficking properties), we first assessed the surface expression of selected Treg surface markers (CD44, CD103, PD-1, CD152, and CD25). The absolute number of renal Tregs expressing these markers per kidney was significantly reduced in nephritic Foxp3eGFP-Cre × Cxcr3fl/fl mice (Supplemental Figure 6C), but we did not find any difference in their relative frequencies (Supplemental Figure 6D). Next, we isolated splenic FoxP3+ Tregs from Foxp3eGFP-Cre × Cxcr3wt/wt and Foxp3eGFP-Cre × Cxcr3fl/fl mice and performed in vitro coculture experiments in the presence of CD4+CD25− wild–type responder T cells. The cytokine concentration in supernatants showed that both wild-type and CXCR3-deficient Tregs were able to suppress IFNγ and IL-2 secretion by cocultivated responder T cells (Figure 3I). Likewise, experiments using nephritic IL-10 reporter mice20 showed that IL-10 expression was comparable between renal CXCR3+ and CXCR3− Tregs (Figure 3J). The efficiency of polarization of naïve CD4+ wild–type and CXCR3−/− T cells into Tregs did not differ between the two groups in vitro (Supplemental Figure 7). Taken together, these data indicate that CXCR3 deficiency in Tregs did not impair their suppressive capacity, polarization, or activation status on the cellular level. To investigate the consequences of impaired Treg migration for the renal T cell response, we performed intracellular flow cytometric analysis. IFNγ+ TH1 cell percentage was significantly increased in the kidneys of nephritic CXCR3 Treg–deficient mice, whereas percentages of IL-17A+ TH17 cells were unchanged (Figure 4, A and B). RT-PCR analysis showed a significant increase in IFNγ (and CXCL9) mRNA expression in nephritic Foxp3eGFP-Cre × Cxcr3fl/fl mice, but no significant change in the expression of the TH17–associated genes IL-17A, CCL20, or CCR6 or the expression of IL-10 (Figure 4C). In agreement with the elevated TH1 response, there was a significant increase in the recruitment of F4/80+ macrophages into the kidney, most likely as a consequence of upregulated renal CCL2 and CCL5 mRNA expression (Figure 4, C and D). CXCR3+ Tregs control renal TH1 responses. (A) Representative FACS analysis and (B) quantification of renal IFNγ+ and IL-17A+ CD4+ T cells from control (n=4), nephritic Foxp3eGFP-Cre × Cxcr3wt/wt (n=10), and nephritic Foxp3eGFP-Cre × Cxcr3fl/fl (n=10) mice at day 30 of nephritis. (C) RT-PCR analysis of renal cortices at day 30 (n=10–12 per group). (D) Representative immunohistochemical photographs and quantification of renal F4/80+ mononuclear phagocyte infiltration at day 30 (n=10–12 per group). Symbols represent individual data points, lines and bars represent means. Original magnification, ×200. Con, control. *P<0.05; **P<0.01. Next, we examined the systemic cellular immune response to the nephritogenic antigen by measuring the cytokine production of sheep IgG–stimulated splenocytes. 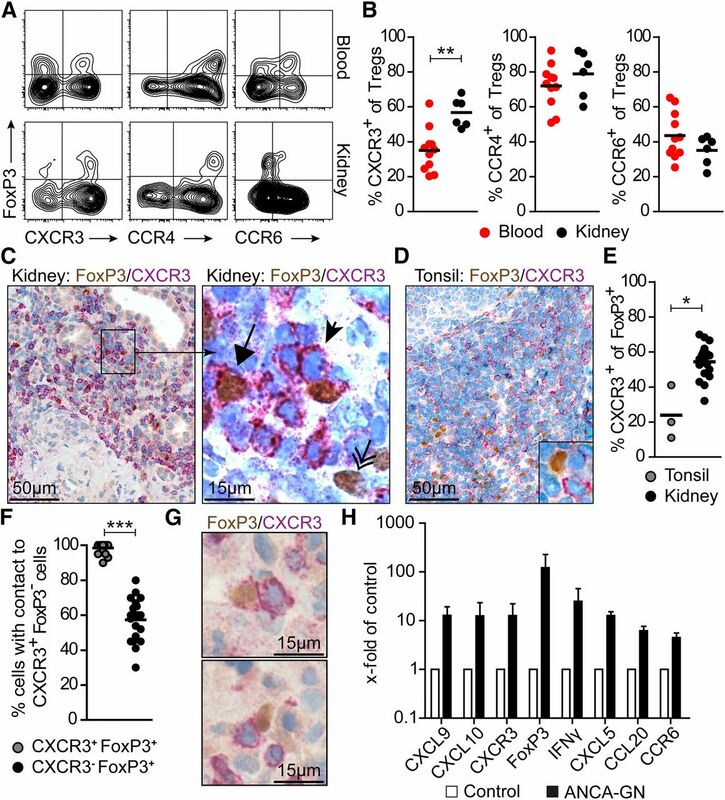 In contrast to the increased TH1 response in the kidney, we did not find a significant change in T cell–associated cytokine production by splenocytes from Foxp3eGFP-Cre × Cxcr3fl/fl mice (Supplemental Figure 8). To assess potential alterations in the humoral immune response, we measured serum titers of mouse IgG, IgG1, IgG2a/2c, and IgG2b antibodies directed against sheep IgG (the nephritogenic antigen) (Supplemental Figure 9A) and analyzed glomerular mouse IgG deposition (Supplemental Figure 9B). The experiments revealed no significant differences between nephritic wild–type and knockout mice. We then addressed the question of whether the course of GN was influenced by ablation of CXCR3 in Tregs. As shown in Figure 5, A and B, glomerular and tubulointerstitial damage was aggravated in nephritic Foxp3eGFP-Cre × Cxcr3fl/fl mice. In addition, BUN levels as a measure of renal function impairment were slightly but significantly higher in mice that were deficient in CXCR3 on Tregs (Figure 5C). Albuminuria was increased in nephritic mice but not significantly different between the two nephritic groups (Figure 5D). Treg-specific ablation of CXCR3 resulted in an aggravated course of crescentic GN. (A) Representative periodic acid–Schiff staining of renal cortices from control (n=4), nephritic Foxp3eGFP-Cre × Cxcr3wt/wt (n=9–12), and nephritic Foxp3eGFP-Cre × Cxcr3fl/fl (n=12–13) mice at day 30. Original magnification, ×200. (B) Crescent formation and tubulointerstitial damage, (C) BUN levels, and (D) albumin-to-creatinine ratio (ACR). (E) Crescent formation and tubulointerstitial damage, (F) BUN levels, and (G) ACR of control (n=4), nephritic Foxp3eGFP-Cre × Cxcr3wt/wt (n=6), and nephritic Foxp3eGFP-Cre × Cxcr3fl/fl (n=6) mice treated with anti-IFNγ antibodies (500 μg two times per week intraperitoneally until day 30). Symbols represent individual data points, and lines represent means. Con, control. *P<0.05; **P<0.01. 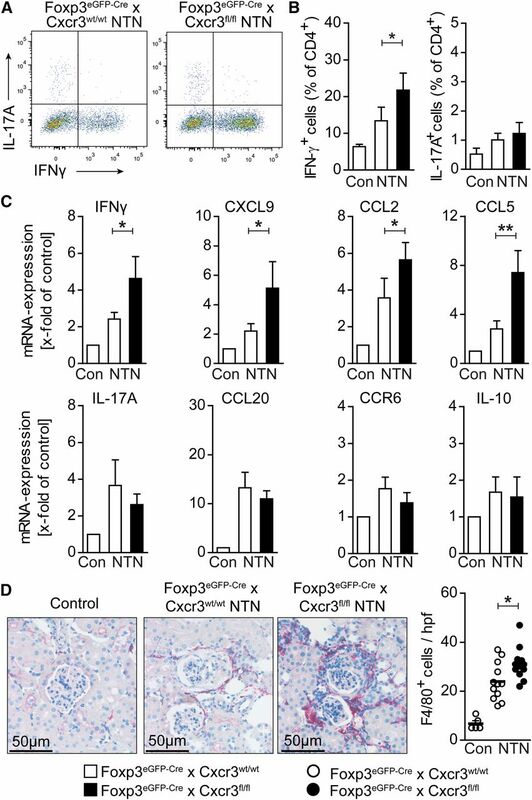 To analyze whether the aggravation of GN in CXCR3–deficient Treg mice was because of the increased TH1 immune response, we inhibited IFNγ by injecting anti-IFNγ antibodies into nephritic Foxp3eGFP-Cre × Cxcr3fl/fl mice and Foxp3eGFP-Cre × Cxcr3wt/wt controls.12 In agreement with previous studies, IFNγ neutralization resulted in a reduction in renal tissue injury in the NTN model.12,21 Most importantly, the IFNγ blockade in nephritic Foxp3eGFP-Cre × Cxcr3fl/fl mice reduced histologic tissue injury to the degree observed in the Foxp3eGFP-Cre × Cxcr3wt/wt control group at day 30 (Figure 5E). Moreover, there were no differences in BUN levels and urinary albumin-to-creatinine ratios between the two nephritic groups receiving anti-IFNγ treatment (Figure 5, F and G). 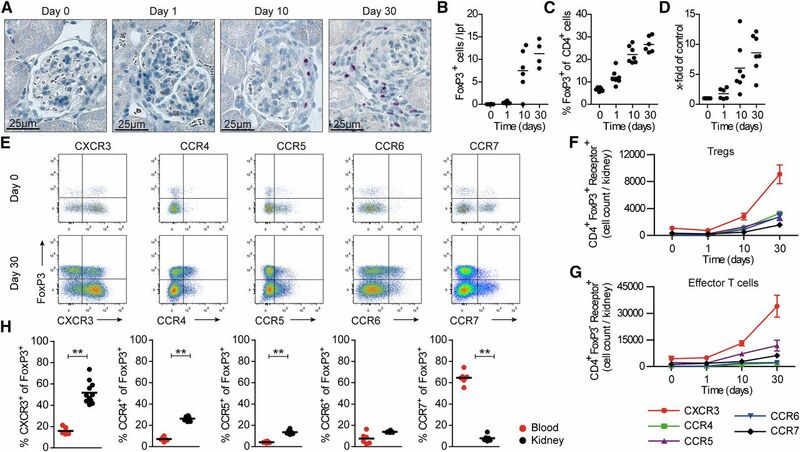 Taken together, this interventional approach indicates that the aggravation of renal tissue inflammation and injury in CXCR3–deficient Treg mice is a consequence of an uncontrolled TH1 response. To further support the data generated using the FoxP3–specific deletion model, we transferred 5×105 wild-type or CXCR3-deficient Tregs together with 1×106 wild–type CD4+ CD25− effector T cells into nephritic RAG1−/− mice. In line with the data presented above, cotransfer of CXCR3−/− Tregs did not protect mice from renal tissue injury, whereas cotransfer of wild-type Tregs effectively suppressed glomerular crescent formation and tubulointerstitial damage (Figure 6). Transferred CXCR3–deficient Tregs fail to control GN in RAG1−/− mice. (A) Representative periodic acid–Schiff-stained kidney sections of RAG1−/− control and nephritic RAG1−/− mice reconstituted with 1×106 CD4+CD25− effector T cells without Tregs, 1×106 CD4+CD25− effector T cells, 5×105 FACS–sorted Foxp3eGFP-Cre × Cxcr3wt/wt Tregs, or Foxp3eGFP-Cre × Cxcr3fl/fl Tregs. Original magnification, ×200. (B) Quantification of glomerular crescent formation and tubulointerstitial injury in the different groups at day 30 after NTN induction (n=3–5 per group). Bars represent means±SEMs. WT, wild type. *P<0.05. Recent landmark studies indicated that, to suppress an overwhelming immune response, Tregs can adopt a phenotype that is specific for a subset of CD4+ T cells by upregulating the respective transcription factors. It was shown that Tregs control TH17 responses in an Stat3-dependent manner,4 whereas the TH1 master transcription factor T-bet controls Treg function during TH1-mediated inflammation.5 Koch et al.5 showed that T-bet–deficient mice were depleted in CXCR3+ Tregs and that T-bet–deficient Tregs showed impaired localization to sites of inflammation. Furthermore, T-bet–deficient Tregs were not able to control or suppress the deleterious TH1 immune response observed in scurfy mice. Consecutive studies imply that the activation of T-bet and the expression of CXCR3 in Tregs depend on IFNγ and IL-27 signaling.22,23 However, it remains unclear whether T-bet activation allows Tregs to acquire specific trafficking properties (for example, by CXCR3 expression) or strengthen certain Treg suppression capacities targeted to the corresponding TH1 response.1 Our data show that CXCR3 is crucial for the migration of Tregs into sites of inflammation and thereby, helps to control an excessive TH1 response in crescentic GN. Of note, CXCR3 deficiency in Tregs did not affect their suppressive capacity, polarization, or activation status. First evidence for a protective role of Tregs in renal autoimmunity, which showed an inverse correlation between the number of circulating Tregs and disease activity in patients with antiglomerular basement membrane nephritis, was provided by Salama et al.24 Studies in murine models of crescentic GN established the protective role of Tregs in kidney tissue injury16–18 and suggested a critical role for Treg-derived IL-10 in the attenuation of disease severity, most likely by modulating both the TH1 and TH17 immune response.20 The anti-inflammatory effects of Tregs are partly dependent on the localization of CCR7+ Tregs to the renal lymph node25 and the trafficking of CCR6+ Tregs into the inflamed kidney.7,26 However, a systematic analysis of the chemokine receptor expression profile on Tregs and their functional role in (renal) autoimmune disease remains to be done. To investigate the potential role of chemokine receptors in Treg trafficking and function, we established a flow cytometry–based technique to analyze renal biopsy tissue from patients with ANCA-associated GN. This approach allowed us to identify the chemokine receptor expression pattern of Tregs in the human kidney. We chose ANCA GN, because recently published data support a role for TH1 cells, TH17 cells, and Tregs in this disease.27–29 Our data show that about 60% of renal Tregs were CXCR3+. Of note, unlike CCR4- and CCR6-positive Tregs, CXCR3-positive Tregs were enriched in the kidney compared with those in peripheral blood. This suggests a recruitment of CXCR3+ Tregs from the circulation into the inflamed kidney. Interestingly, CXCR3+ Tregs colocalized with CXCR3+ cells, most likely TH1 cells, which might be a prerequisite for the control of TH1 responses. Moreover, we showed the upregulation of renal mRNA expression of the CXCR3 ligands and the infiltration of CXCR3+ TH1 cells into the kidneys of these patients. To gain further insight into the functional role of chemokine receptors in Treg function, we used a model of crescentic GN (NTN). In a first step, we assessed the expression patterns of several chemokine receptors that have been linked to Treg function.9 Among the receptors tested, CXCR3 was by far the most abundantly expressed one. CXCR3 is rapidly induced on naïve T cells after activation and preferentially remains highly expressed on CD4+ TH1 cells, effector CD8+ T cells, and NKT cells. In addition, it has a critical role for the recruitment of these cells in inflammation.30 A role of CXCR3 in Treg trafficking has recently been suggested in the EAE model and ConA-induced hepatitis.31,32 The recruitment of CXCR3+ T cells into the kidney was shown in human and experimental GN,33,34 and subsequent studies showed that CXCR3 mediates T effector cell recruitment and tissue injury in experimental models of crescentic GN.35,36 These studies show the potential beneficial effect of nonselective CXCR3 blockade in crescentic GN. Our results suggest, however, that specific targeting of CXCR3 on TH1 cells or the blockade of TH1-specific mediators would be even more effective than pan-CXCR3 neutralization in TH1–driven inflammatory diseases. RAG1−/− mice were bred at the animal facility of Universitätsklinikum Hamburg-Eppendorf. All mice were on the C57BL/6J background and raised under specific pathogen–free conditions, and the genotype was confirmed by PCR analysis in each animal before experimental use. Animal experiments were performed according to national animal care and ethical guidelines and approved by local ethics committees. NTN was induced by intraperitoneal injection of 2.5 mg nephrotoxic sheep serum per 1 g body wt into 8- to 10-week-old male mice as previously described.7 For urine sample collection, mice were housed in metabolic cages for 5 hours. Urinary albumin excretion was determined by standard ELISA analysis (Mice-Albumin Kit; Bethyl), whereas urinary creatinine, BUN, and serum creatinine were measured using standard laboratory methods. Total RNA of the renal cortex was prepared according to standard laboratory methods. Real-time PCR was performed for 40 cycles on a StepOnePlus Real-Time PCR System (Applied Biosystems, Foster City, CA) as previously described.26 All samples were run in duplicate and normalized to 18S rRNA. Glomerular crescent formation and tubulointerstitial injury in stained murine kidney sections were assessed as described.40 Paraffin-embedded sections (2 µm) were stained with the following antibodies: CD3 (A0452; Dako), F4/80 (BM8; BMA), mouse IgG (Jackson Immunoresearch Laboratories), and to identify cells in humans, CXCR3 (1C6; BD Pharmingen) and FoxP3 (236A/E7; Abcam, Cambridge, United Kingdom). The frequency of Foxp3+ CXCR3+ cells and the direct spatial association with Foxp3− CXCR3+ cells were quantified by counting at least 10 high-power fields per biopsy specimen (magnification, ×400) in a blinded fashion.7 Glomerular CD3+ cells in 30 glomerular cross-sections (magnification, ×400) and tubulointerstitial F4/80+ and CD3+ cells in 30 high-power fields (×400) per kidney were counted in a blinded manner. All slides were evaluated by Axioskop Light Microscopy (Carl Zeiss, Jena, Germany) and photographed with an Axiocam HRc (Carl Zeiss) or by confocal microscopy with an LSM 510 Metamicroscope using the LSM software. Previously described methods for leukocyte isolation from murine kidneys, spleens, and lymph nodes were used.26,41 Measurements were performed on a BD FACS LSR II, and data were analyzed with the FlowJo software (TreeStar, Inc.). The following anti-mouse or anti-human antibodies were used: CD45, CD3, CD4, CD8, CD25, CD40L, CD44, CD62L, CD69, CXCR3, CCR4, CCR5, CCR6, CCR7, CCR3, γd-TCR, NK1.1, IL-17A, IFNγ, TNFα, Foxp3, CD45RA, HLA-DR, and CD127 (Biolegend, San Diego, CA; BD Biosciences; eBioscience, San Diego, CA; and R&D Systems; clones are available on request). LIVE/DEAD Staining (near infrared; Invitrogen Molecular Probes, Eugene, OR) was used to exclude dead cells during flow cytometry and ensure viability of the cells after the stimulation procedure. Splenocytes (4×106 cells per milliliter) were cultured under standard conditions in the presence of normal sheep IgG (10 µg/ml; Sigma-Aldrich, Taufkirchen, Germany), and supernatants were harvested after 72 hours. Cytokine levels in supernatants were measured by cytometric bead assay (BD Biosciences) according to the manufacturer’s instruction. Circulating sheep globulin–specific serum IgG titers were analyzed by ELISA (total IgG; Biozol, Eching, Germany). For polarization of naïve CD4+ cells, splenocytes were isolated from naïve Foxp3eGFP-Cre × Cxcr3wt/wt or Foxp3eGFP-Cre × Cxcr3fl/fl mice using MACS CD4+ T Cell Isolation Kit II (Milteny Biotec, Bergisch-Gladbach, Germany). In total, 5×105 cells per well was plated in anti–CD3 antibody–coated 96–well plates (eBioscience) and incubated for 65 hours with soluble anti-CD28 (Biolegend). For TH0 conditions, anti-IFNγ (Biolegend) was added, and for Treg conditions, TGFβ (Biolegend) and IL-2 (Pepro Tech, Rocky Hill, NJ) were additionally added. RNA was isolated from paraffin–embedded renal samples obtained from patients with ANCA-associated GN and controls (preimplantation kidney biopsies) using the RNA Micro Kit (Roche Diagnostics, Mannheim, Germany).40 Single-cell suspensions were obtained from human biopsies by enzymatic digestion in RPMI1640 with collagenase D (0.4 mg/ml) and deoxyribonuclease type I (10 μg/ml; Roche Diagnostics) at 37°C followed by dissociation with gentleMACS (Miltenyi Biotec). Samples were filtered through a 30-μm filter before antibody staining and flow cytometry. Analyses of human kidney biopsies were approved by the local ethics committees (PV3162). The results are shown as means±SEMs when presented as a bar graph and single data points with means when presented in a scatter dot plot. The results reported here are means±SEMs. Differences between two individual experimental groups were compared using a two–tailed t test. In case of three or more groups, one-way ANOVA with Bonferroni multiple comparisons test was used. P<0.05 was considered to be statistically significant. We thank A. Rudensky for providing us with Foxp3-Cre mice. This work was supported by Deutsche Forschungsgemeinschaft Grant KFO 228: PA 754/7-2 (to C.F.K. and U.P.). H.-J.P. and J.-H.R. contributed equally to this work. This article contains supplemental material online at http://jasn.asnjournals.org/lookup/suppl/doi:10.1681/ASN.2015020203/-/DCSupplemental.